The nation is celebrating the 49th Independence and National Day today, refreshing the resolution to uphold the spirit of the War of Liberation and build a ‘Sonar Bangla’ as dreamt by Father of the Nation Bangabandhu Sheikh Mujibur Rahman. On the eve of the day, President M Abdul Hamid and Prime Minister Sheikh Hasina gave separate messages extending heartfelt greetings and warm felicitations to the countrymen living both at home and abroad. The government has taken elaborate programmes to celebrate the day. On this auspicious occasion, glowing tributes are being paid to the martyrs and veterans of the War of Liberation. 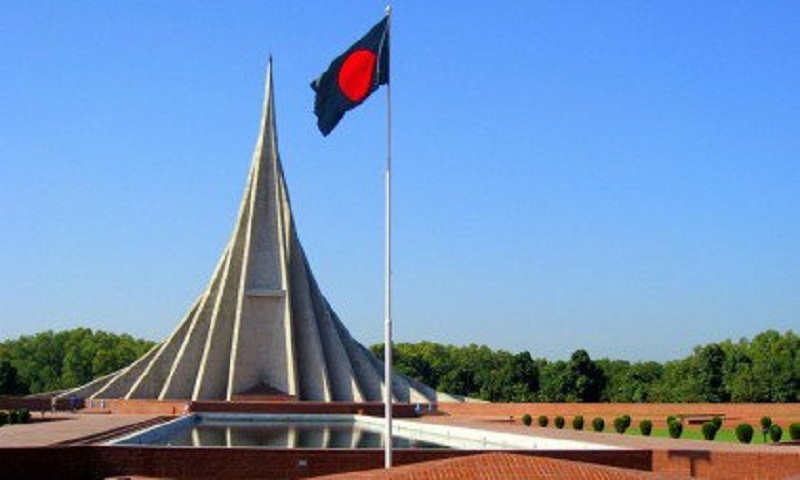 The national mausoleum at Savar became the main venue of the celebration of the day where President Md Abdul Hamid and Prime Minister Sheikh Hasina placed wreaths early in the morning as a mark of profound respect to the memories of the martyrs. Families of Bir Shreshthas, war wounded freedom fighters, members of the diplomatic corps, leaders of different political parties, social, cultural and professional bodies and people from all walks of life are also laying wreaths at the national mausoleum. The day’s programmes are supposed to begin by heralding a 31-gun salute early in the morning as a mark of profound respect to the heroic struggle of this nation, which suffered a protracted subjugation under foreign rules from time to time till achieving their coveted Independence in 1971. The nation is also paying glowing tributes to Father of the Nation Bangabandhu Sheikh Mujibur Rahman and valiant sons of the soil whose supreme sacrifices freed the country from the shackle of Pakistan. The national flag is flying atop all government and private buildings while all streets and important city intersections have been decorated with national and multi-coloured miniature flags and festoons. Important buildings and establishments as well as city streets and islands have been illuminated with colourful lights. The national anthem ‘Amar Sonar Bangla’, written by Nobel laureate Rabindranath Tagore, is being sung simultaneously across the country and Bangladesh missions abroad. National dailies brought out special supplements while Bangladesh Betar, Bangladesh Television, private radio stations and television channels are airing special programmes highlighting the significance of the day. Bangladesh Shilpakala Academy, Bangla Academy, National Museum, Liberation War Museum, Bangladesh Shishu Academy, and other social and cultural organisations are arranging discussions, cultural programmes, painting competition for children, sports competition and documentary exhibition. Reception is going to be accorded to freedom fighters and the members of martyred freedom fighters at city, zila and upazila levels, while Bangladesh Postal Office is supposed to publish commemorating postal stamps. Special prayers are being offered in all mosques, temples, churches and other places of worship across the country seeking divine blessings for the eternal peace of the departed souls of Father of the Nation, four national leaders, martyrs of the War of Liberation and all other patriotic sons of the soil. Improved meals are supposed to be served to the inmates of hospitals, jails, old homes and orphanage centres to mark the day. The country’s all children’s parks and museums remain open for all. Arranged by the Mass Communication Department, singers are rendering patriotic songs on the city streets riding on mobile vehicles and on waterways of Dhaka city traveling by water vessels. Every year, the March 26 brings the most tragic reminiscence of the history’s blackest episode that heralded a nine-month bloody ordeal from the night of March 25, 1971, achieving the long-cherished independence on December 16 at the same year at the cost of a sea of blood.